Now you can put your tasty leftovers to good use to make this beef fried recipe or you can start from square one with uncooked ingredients. Either way, you must use cold leftover cooked rice, otherwise, freshly prepared rice will create a gloppy mess. Flank steak, a tough cut of meat, is traditionally cooked low and slow for many hours using a technique called braising to break down the connective tissue. But in this recipe, it will only get a few minutes of cooking. Marinating will help to tenderize it but it needs to be sliced thinly so it can cook quickly and not toughen up further. In order to do this easily, freeze the steak until it is semi-solid and slice across the grain. In a large bowl, mix together dark soy sauce, light soy sauce, sugar, sesame oil, white pepper, and cornstarch until well combined. Add the beef, tossing it in the marinade to make sure all sides of the meat are covered. Let stand at room temperature while preparing the rest of the recipe (at least 10 minutes). Lightly beat the egg with the salt and set aside. Heat a wok on high heat. Add 1 tablespoon of the peanut or vegetable oil. When the oil is hot, add the garlic. Stir-fry for a few seconds until aromatic, then add the onion. Stir-fry for 1 to 2 minutes, until it starts to brown and soften. Add the beef and let brown briefly, then stir-fry until it changes color. Heat remaining 2 tablespoons of peanut or vegetable oil in the wok. Reduce the heat to medium. Add the rice, stirring and turning it over with a spatula to heat through and break up any clumps. Add the peas and shredded carrot, stirring to combine. Make room in one corner of the wok and pour in the beaten egg. Scramble the egg and then combine with the fried rice. Stir in the chopped green onion. Do a taste test and add a bit more salt and/or pepper if desired. Serve hot. Serve this fried recipe as a main course or as just one of a multi-dish feast including, perhaps, egg foo yung, sweet-and-sour shrimp, and homemade fortune or almond cookies for dessert. There are so many ways to prepare fried rice, they are limited only by your imagination. Consider using chicken, pork, shrimp, crab, or scallops in place of beef. Cooked meats and vegetables can be added at the end and just warmed up a bit so they don't become overcooked. 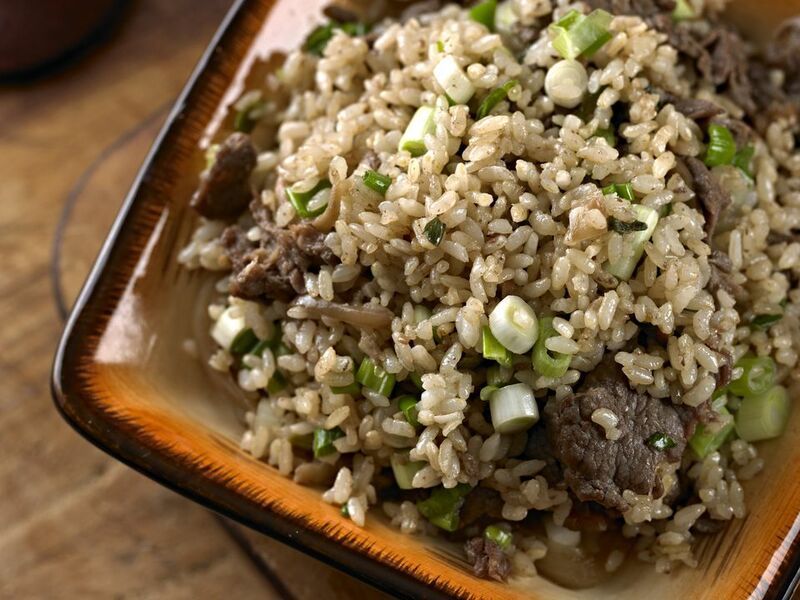 Asian vegetables like pea pods, bamboo shoots, and bean sprouts make crunchy and tasty additions to fried rice.